Hundreds of pilgrims forced from Judaism's holiest site by Muslim mob. Activist: "Police failed to carry out their duties again"
Hundreds of Jews came to the Temple Mount Monday in honor of Tisha B'Av, the anniversary of the destruction of the two Jewish Temples by the Babylonian and Roman empires respectively. But their visit was cut short as Muslim worshippers physically blocked them and appeared to be preparing a riot. Michael Fua, of the Jewish Leadership faction of the Israeli Likud Party, was at the Mount. “Today, on the eve of Tisha B'Av, the Israel Police failed do discharge its duties again,” Fua accused. “Hundreds of Jews who came to the Mount from all parts of the Land of Israel, were kept waiting for a long time at the entrance to the Mount, at the only gate where Jews are allowed to pass, while hundreds of Muslims entered from the other gates without any check or delay. Fua, who videotaped the event, explained: “The video shows Dr. Yoel Elitzur and some of the ascenders, faced by the Muslim mob that is familiar to us from the previous days. It s amazing to see how the Israel Police plays into the hands of the Muslim rioters, and actually encourages them to threaten and run amok. This latest incident comes as Likud-Beyteinu MK Moshe Feiglin challenges a ban preventing him from ascending the Temple Mount. In the letter to Attorney General Yehuda Weinstein, Feiglin said the ban was in contradiction to three basic laws: the Jerusalem Basic Law, the Knesset Basic Law and the Basic Law on Human Dignity and Freedom. Feiglin also claimed the prohibition went against the freedom-of-religion clauses of the Declaration of Independence. The Temple Mount is Judaism's holiest site, where the two holy Temples once stood before being destroyed by the Babylonian and Roman empires respectively. This Tuesday marks the anniversary of the destruction of both temples (which occurred on the same day in the Hebrew calendar - the 9th of Av). Despite its supreme importance to Jews worldwide, Jews are subject to draconian limitations on the Mount, including a ban on praying, due to the presence of an Islamic complex, administered by the Waqf Islamic Trust, and threats by Islamist groups. The Israeli police are able to bypass court decisions upholding the Jewish right to prayer there by citing unspecifiied "security concerns", either to ban individual activists or even to issue blanket prohibitions on Jews ascending at all. Religious Jews are followed closely by Israeli police and Waqf guards to prevent them from praying, or from carrying out any other religious rituals. Non-Jewish visitors are not subject to such restrictions. 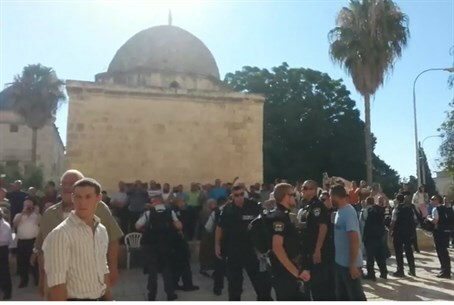 Apart from pressuring authorities to ban Jewish prayer, the Waqf has also been accused of destroying Jewish artefacts on the mount, in a concerted effort to Islamize the site and deny all Jewish connection to it. Palestinian Media Watch, an NGO set up to monitor extremism within the Palestinian media, reports regularly on what it claims is a campaign by the Palestinian Authority and Islamist groups to erase the Jewish connection to Jerusalem entirely.